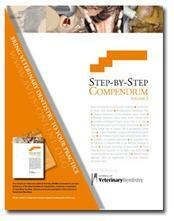 The Step-by-Step feature was first introduced in the March 2001 issue of the Journal of Veterinary Dentistry (J Vet Dent). The aim of this feature was, and is, to provide the clinician with a primarily pictorial, step-by-step guide on how to perform dental and oral surgical procedures. Generally, this type of presentation is sparse in veterinary dental textbooks, yet a highly sought after format for continued professional development in the discipline. Mandibular Incisor Apically Repositioned Flap in the Dog. 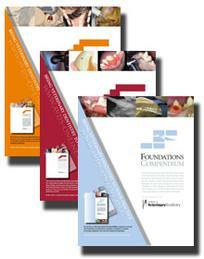 These 16 procedures, originally published in 2004, 2005, 2006, and 2007, are now available in one collection: The Step-by-Step Compendium, Volume 2. 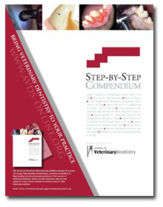 The Step-by-Step Compendium, Volume 2 will greatly enhance and extend the libraries of any individual or organization involved with veterinary dentistry. The Foundations feature was introduced in the Journal of Veterinary Dentistry (J Vet Dent) in 2003 in response to requests for information for veterinarians and technicians with a specific interest in veterinary dentistry. This feature includes articles that highlight different aspects of veterinary dentistry discussed at a high level, but in an understandable fashion. 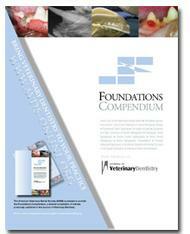 The Foundations Compendium, a special publication from the American Veterinary Dental Society, is a compilation of Foundations series features which appeared in the pages of the J Vet Dent in 2003, 2004, and 2005 to combine text and pictures to highlight basic, fundamental aspects of veterinary dentistry. Clarification of Veterinary Dental Nomenclature. 88 pages, 214+ images.